Carolina Herrera 212 VIP for Women is designed for young, creative, modern women. 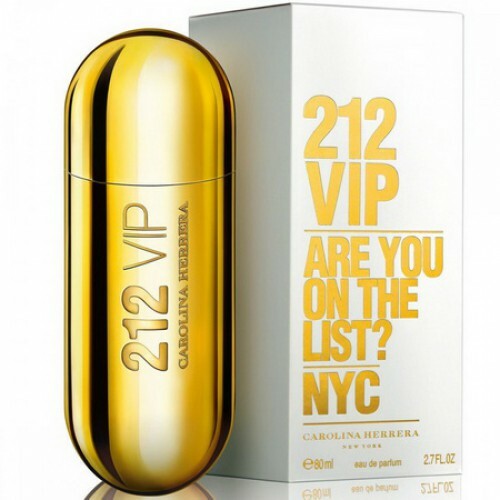 Carolina Herrera 212 VIP for Women 80ml. Eau De Parfum - Fragrance carolina herrera 212 vip is based on the notes of the same, getting more refined fragrance that draws temptation, sensuality and the unpredictability of life in the modern metropolis - the means to achieve their dreams. Floral-citrus nuances with hints of sandalwood, musk represent the essence of human nature, able to achieve their goals. Inflorescence and orange camellia, gardenia and lily, mandarin and bergamot with musk and sandalwood make luxury bouquet Carolina Herrera 212 VIP. I enjoy being in the spotlight? Adore private parties? Find yourself on the guest list! New explosive cocktail with the intriguing title 212 VIP embodies the lifestyle of clubbers and noisy parties, passing backstage atmosphere trendy hangouts where they like to rotate, and which do not tolerate outsiders. 212 VIP charges its possessor energy and drive of the city, which never sleeps and invites me to visit those who like to relax and have fun all night long. 212 VIP - pleasure at any time of year! As often happens is that you can not sleep at night? Trying to close his eyes, but sleep did not come? Perhaps at this point you have to be somewhere else, and not to think about life, lying in bed. For example, in the heart of the night city. Breathe deeply, enjoying the aroma of thick dark night and captivating music most luxurious club in the city. To get to their true element and become a welcome guest there will help you stunning Perfume 212 VIP by CAROLINA HERRERA. Just one press of the coveted bottle endow you with previously unknown force. You will feel a new energy that is ready is about to break free. Feel her femininity and sexuality. With intense passion envelops you like a warm shawl, and become your worthy continuation. Each time it will open a new, generously giving their rich oriental hues. Try and make sure to be an important person as naturally as myself! Date fragrance: oriental, vanilla initial note: rum, passion fruit note "Hearts": musk, gardenia Final note: vanilla, tonka bean.